All will be revealed for fans who have breathlessly awaited the sizzling sequel to Juliet Immortal. 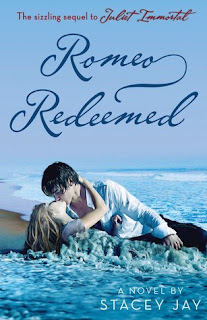 This time Romeo takes center stage and gets one chance, and one chance only, to redeem himself. Cursed to live out eternity in his rotted corpse, Romeo, known for his ruthless, cutthroat ways, is given the chance to redeem himself by traveling back in time to save the life of Ariel Dragland. Unbeknownst to her, Ariel is important to both the evil Mercenaries and the love-promoting Ambassadors and holds the fate of the world in her hands. Romeo must win her heart and make her believe in love, turning her away from her darker potential before his work is discovered by the Mercenaries. While his seduction begins as yet another lie, it soon becomes his only truth. 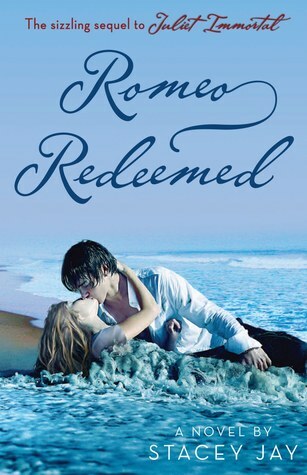 Romeo vows to protect Ariel from harm, and do whatever it takes to win her heart and soul. But when Ariel is led to believe his love is a deception, she becomes vulnerable to Mercenary manipulation, and her own inner darkness may ultimately rip them apart. When Romeo was cursed and bound to his rotting corpse he knew he would do anything to escape that horrible fate. So when he is given a second chance at redemption, he leaps at the opportunity. His task is to convince Ariel Dragland to believe in love, and thus preventing a cascade of events that could destroy the world. Known for his seductive ways, Romeo believes this task will be a piece of cake, but he quickly realizes his mistake as he starts to fall for her instead. Now he's questioning his motives and his own horrible fate means nothing to him anymore as Ariel becomes the Mercenaries target. Can love truly conquer all or will darkness prevail? I absolutely loved the first book in this series, Juliet Immortal. I just felt like it fixed everything I couldn't stand about the original story and made it so much better. I'm just not big on tragedy and heartache. That being said, when I saw that Romeo would be getting his own chance at happiness, I was more than excited to see how things played out. I was really hoping to be swept right off my feet like I was the first time around, but unfortunately that never happened. Even though I had seen a spark of goodness in Romeo from the first book, I had a hard time believing his insanely quick transition this time around. In fact, he seemed rather sappy all too quick as well as way too willing to sacrifice himself considering his history. They say love conquers all, but despite being a hopeless romantic, in this case I can't help but being a little skeptical. Another thing that really frustrated me about this book was the lack of answers. In fact there were a lot of part that were quite confusing as they just weren't explained very well. I realize that the characters really had no idea either, and just were flying by at the seat of their pants, but I still think a little more explanation and resolution would have gone a long way, especially when it came to Ariel's episodes. Also, I still don't really understand the business between the Missionaries and the Ambassadors other than they are locked in some epic struggle that winds up hurting so many others. Well, the Missionaries was quite obviously evil, so his agenda was pretty straightforward. It was the Ambassadors that left me scratching my head, as some of Nurse's actions were anything but good and pure, making her seem almost evil as well. I really wanted to know what the heck they were other than two powerful beings toying with others, but perhaps that's the point right there. In all honestly I'm not really sure how I feel about Romeo Redeemed in the end as I'm stuck between a two and three rating. But since it was able to mostly hold my attention to the end, I'll round up to a three. It's just rather frustrating to go from my resounding five star rating of Juliet Immortal to the decidedly less enjoyable Romeo Redeemed. It is one of those cases where I can't help thinking that things should have been left as a stand alone, considering just how satisfying things were left at the end of Juliet Immortal. Don't get me wrong, I did enjoy seeing how Romeo ended up where he did at the very end of Juliet Immortal, it's just that there also was a lot of frustration involved that lessened the overall enjoyment factor.